TouchControls iOS Framework library from Rustemsoft LLC is Swift | Objective C software package specifically designed for Xcode developers. The library allows you to use all strengths of the Rustemsoft UIChart control without waiving the user interface elements your customers need. UIChart gives you the flexibility to bind to any datasource that supports a mutable array NSMutableArray object interface. And with the bunch of class properties, you can configure a chart of any complexity quickly and easily in your code. Chart objects can be positioned next to each other or overlap each other. This gives you the freedom to create custom charts. The plot area is found inside the chart, and is where the UIChart control plots the data series. It is also where axes, grid lines, hatch lines, gradient layouts, and chart items are drawn. Axis labels are always outside of the plot area, but most other elements are found within the plot area. 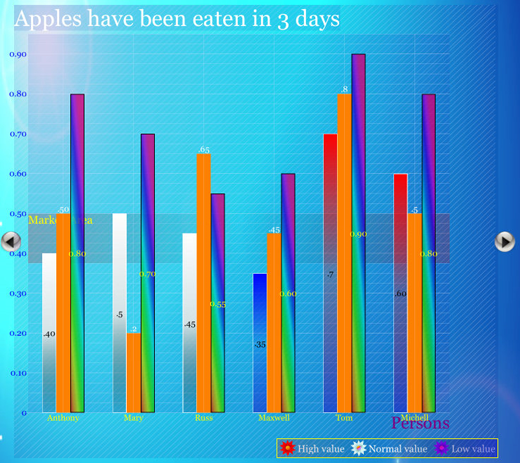 Each chart contains a plot area, where the Chart control plots the data series. 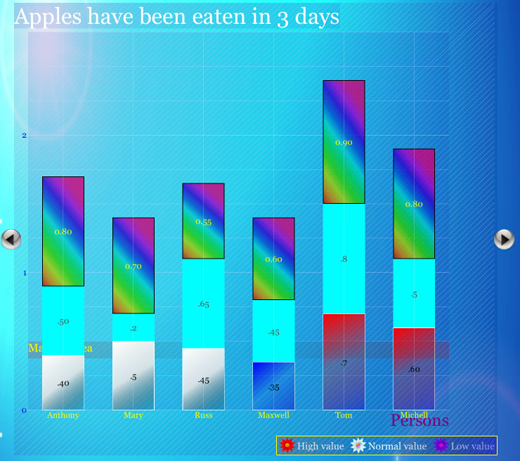 When you change the appearance properties of the chart, it changes the appearance of the plot area. A collection of chart items. For more information, see ChartItem Class. A collection of chart series. For more information, see ChartSeries Class. A collection of legends. For more information, see legend Class. A collection of legend areas. For more information, see legendArea class. A collection of marked regions. For more information, see markedRegion class. Also we have built Xcode sample projects that describe the concepts and techniques that you can use to build UIChart features into your apps. The Area chart consists of a series of data points joined by a line and where the area below the line is filled. 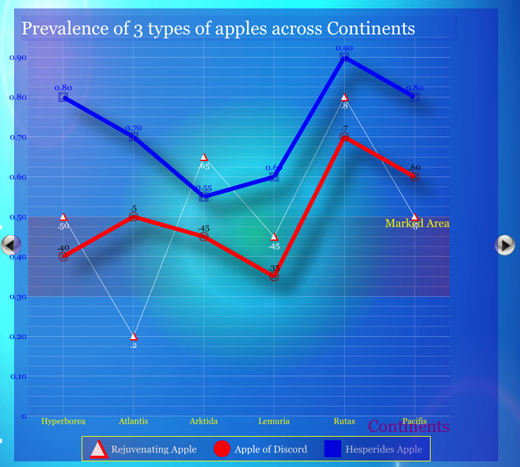 Area charts are appropriate for visualizing data that fluctuates over a period of time and can be useful for emphasizing trends. Note: Values that don't vary too wildly work best for area charts. Area charts display series in the order they are added, back-to-front. The appearance for each series can be modified directly. By default the chart orientation is vertical. To create a Horizontal Area Chart set the UIChart orientation property to horizontal. The following code example creates a UIChart object as Area and adds it to the app's main view (ViewController) layout. Please read the TouchControls iOS Framework documentation to learn more about the UIChart class provided properties and class methods. The Stacked Area chart is a variation of the Area chart that display trends of the contribution of each value over time (or across categories). The areas are stacked so that each series adjoins but does not overlap the preceding series. This contrasts with the Area chart where each series overlays the preceding series. The appearance for each series can be modified directly. By default the chart orientation is vertical. To create a Horizontal Stacked Area Chart set the UIChart orientation property to horizontal. The following code example creates a UIChart object as Stacked Area and adds it to the app's main view (ViewController) layout. 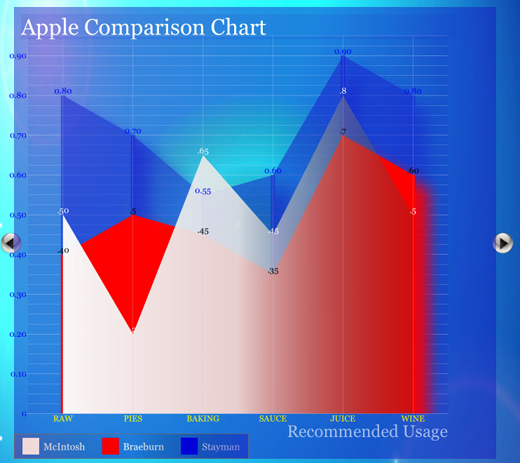 Bar charts graphically summarize and display categories of data and let the user easily compare amounts or values between different categories. Bar charts are useful for comparing multiple series of data (i.e. providing snapshots of data at particular points in time). In the examples above the categories are various values (High, Normal, Low) that combine to make the total for each persone. You can set code to display each series in a different color to make them easier to distinguish. By default the chart orientation is vertical. To create a Horizontal Bar Chart set the UIChart orientation property to horizontal. The following code example creates a UIChart object as Bar and adds it to the app's main view (ViewController) layout. Stacked bar charts are used to compare contributions of values to a total across categories. In the examples above the categories are various values (High, Normal, Low) that combine to make the total for each persone. Use the Stacked Bar chart when you need visibility to the combined values for each category. By default the chart orientation is vertical. To create a Horizontal Stacked Bar Chart set the UIChart orientation property to horizontal. The following code example creates a UIChart object as Stacked Bar and adds it to the app's main view (ViewController) layout. Cylinder chart graphically summarizes and displays categories of data and let the user easily compare amounts or values between different categories. Cylinder chart is useful for comparing multiple series of data by providing snapshots of data at particular points in time. In the examples above the categories are various values (Cooking, Backing, Eating Fresh) that combine to make the total for each apple type. You can set code to display each series in a different color to make them easier to distinguish. By default the Cylinder chart orientation is vertical. To create a Horizontal Cylinder Chart set the UIChart orientation property to horizontal. The following code example creates a UIChart object as Cylinder and adds it to the app's main view (ViewController) layout. Stacked Cylinder charts are used to compare contributions of values to a total across categories. 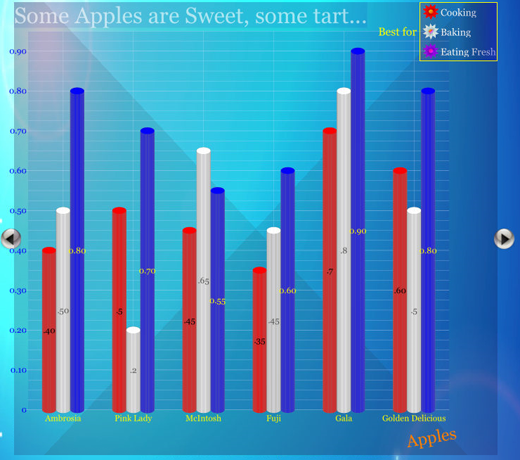 In the examples above the categories are various values (Cooking, Backing, Eating Fresh) that combine to make the total for each apple type. Use the Stacked Cylinder chart when you need visibility to the combined values for each category. By default the chart orientation is vertical. To create a Horizontal Stacked Cylinder Chart set the UIChart orientation property to horizontal. The following code example creates a UIChart object as Stacked Cylinder and adds it to the app's main view (ViewController) layout. Line charts are used to display a series of data points, typically to show trends over a period of time. One or more series of data can be used and the appearance for each series can be tailored to emphasize the data using unique colors, line thicknesses, shadow, gradient layout style, and point marks. You can set code to display each line in a different color to make them easier to distinguish. By default the Line chart orientation is vertical. To create a Horizontal Line Chart set the UIChart orientation property to horizontal. The following code example creates a UIChart object as Line and adds it to the app's main view (ViewController) layout. Pie chart is used to display the contribution of fractional parts to a whole. A Pie chart uses a single series of data. Multiple series of data can be defined and are each displayed in a separate pie chart. 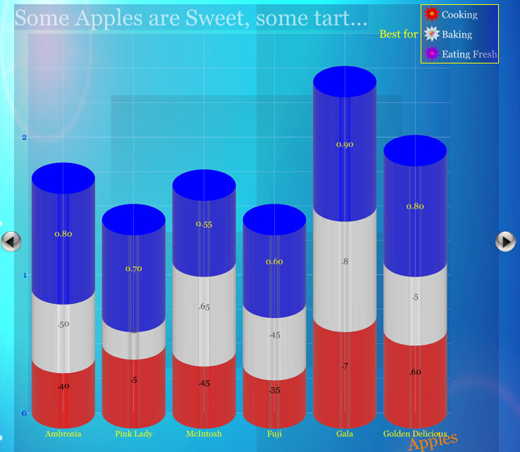 You can adjust the look of each pie slice individually by working with the pie chart series properties. By default the Pie chart series pie3D property set to YES. 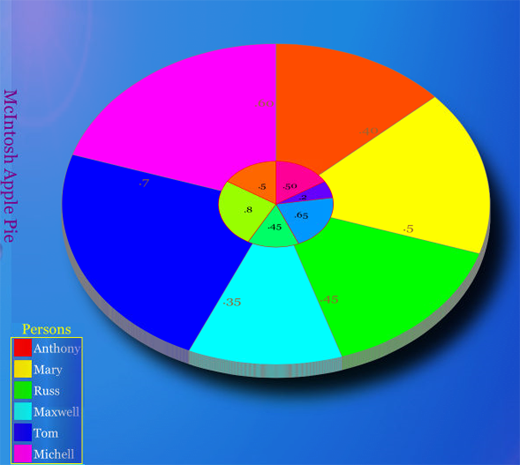 To create a 2D Pie Chart set the UIChart series pie3D property to NO. The following code example creates a UIChart object as Pie and adds it to the app's main view (ViewController) layout. 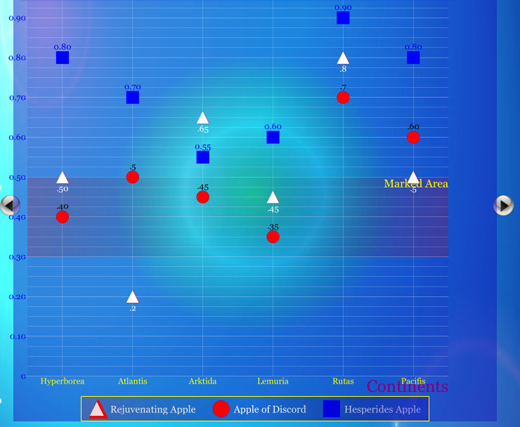 Point chart is used to show correlations between several sets of values. The point chart lets user observe the dependence of one value to another and is often used for scientific data modeling. 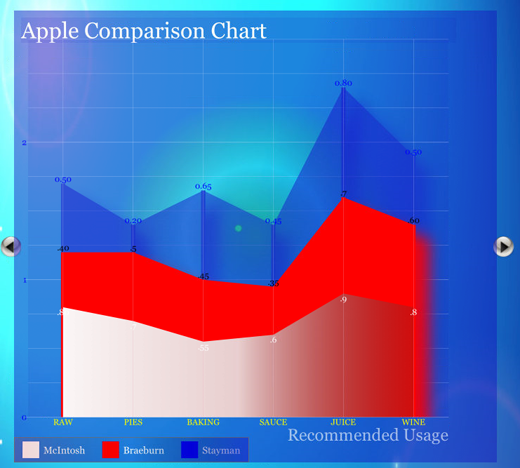 The Point chart is usually not used with time dependent data where a Line chart is more suited. To change the view of any particular point use the chart item's properties. By default the Point chart orientation is vertical. To create a Horizontal Point Chart set the UIChart orientation property to horizontal. The following code example creates a UIChart object as Point and adds it to the app's main view (ViewController) layout. Suppose you are building a project using Xcode, and you decide that you want to start consuming Rustemsoft TouchControls library for a UIChart control and/or UIDataGrid control on your iPhone/iPad app. The first step that you will generally take is you will add a reference to the TouchControls library, which is residing in some directory on your Mac hard drive. 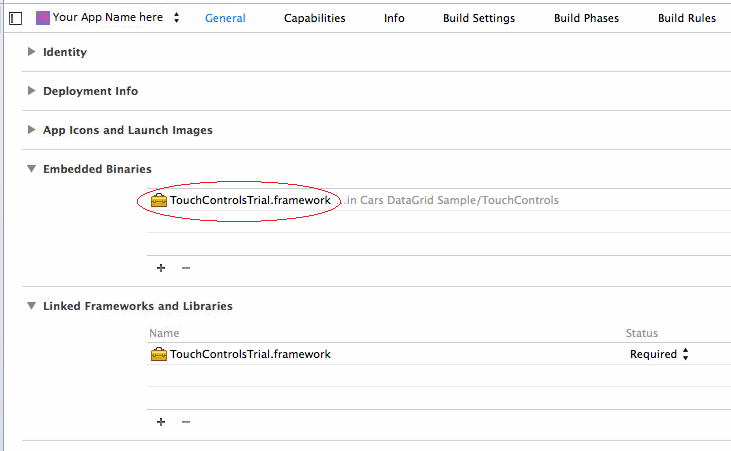 Xcode will then add a new item in Project Navigator, and it will create a row node called 'TouchControls.framework'. Download the Rustemsoft TouchControls library code samples for Swift & Objective C that show how you can use the RustemSoft UIChart control in your Xcode project.